El Nido is one of Palawan’s top destinations for tourists wanting to hit the beach. Conde Nast and CNNGo has listed it as having one of the most beautiful beaches in the world and it is the inspiration for The Beach, a popular backpacker movie that starred Leonardo DiCaprio. And indeed, the most stunning beaches can be found here. Besides having fine white sand, El Nido boasts of incredible islands and islets towering with cathedral-like limestone karsts similar to those that can be found at Vietnam’s Halong Bay, China’s Guilin, and Thailand’s Krabi. Its underwater marine life is also not to be missed, boasting of healthy coral beds perfect for both snorkeling and diving. Among the top three tourist spots in Palawan, El Nido edges Coron, albeit barely, in terms of beauty. 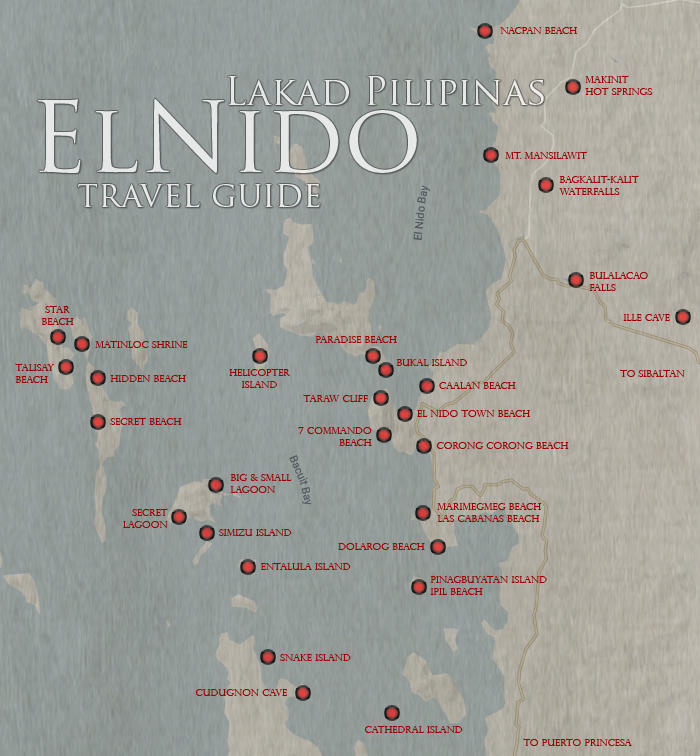 Getting to El Nido may not be as easy, but the travel time is very much worth it. 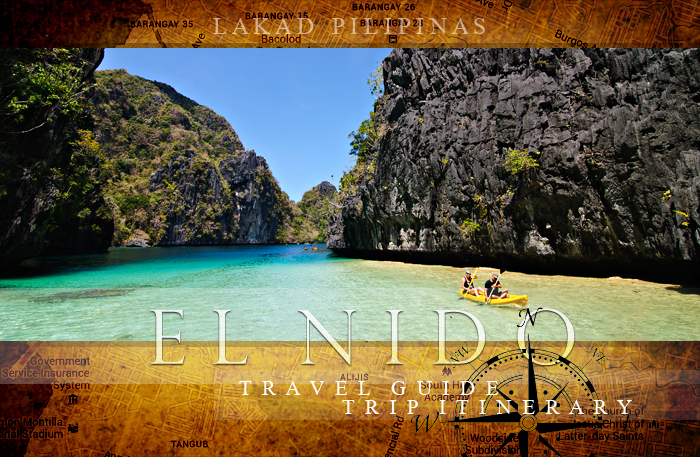 This El Nido travel guide will discuss how to get there, where to stay, what to eat, and where you must go, on the cheapest possible budget. El Nido can be affordable, if you travel the right way. El Nido is located 420 kilometers from Manila. Set on the upper part of the Palawan peninsula, it is bordered by the town of Linapacan on the north and Taytay on the south. The cheapest way to reach it is by taking a flight from Manila to the capital of Palawan, Puerto Princesa, then taking a five-hour van or bus ride to El Nido town. From the Puerto Princesa International Airport, there are already vans that offers private and sharing rides to El Nido. For a more inexpensive option, you may head to the San Jose Terminal by taking a tricycle, and from there board the public buses heading for El Nido. Tip, if you’re actually taking the aircon bus to El Nido, it would be much cheaper if you take the vans at the airport instead since you won’t have to shell out additional pesos for the tricycle ride to the San Jose terminal. There are direct flights from key cities in the Philippines like Manila, Davao, Iloilo, Cebu, and Boracay to El Nido provided by a lone airline, Airswift, but the fare is about thrice the price of flights going to Puerto Princesa. El Nido can also be reached from Coron, another popular destination in Palawan, by boats and ferries. Travel time can be tediously long though. Some tour operators offer a slow boat experience, taking two, and sometimes three days, passing through the islands of Linapacan en route to El Nido and vice versa. ● The best time to visit El Nido is during the summer months in the Philippines—between March, April, and May. The only drawback is the number of tourists going with you. You may considering visiting during El Nido’s off-peak season—June to November—but the chances of rain during your island hopping tours is pretty high. ● If you’re gonna go island hopping, bring a drybag with you. It helps, especially if you’re going to enter the Secret Lagoon and the Secret Beach. ● Don’t miss out taking pictures of the underwater life in El Nido, if you don’t have an underwater camera with you, you can rent one in town. ● Bring enough money with you. Most transactions in El Nido are done in cash. There’s an ATM at El Nido town, but it runs out of cash pretty fast. If you have foreign currencies, there are banks and money changers in town. Tours in El Nido can’t really be done DIY unless you own a boat since most of these involve going out to sea. Most tourists book their tours right on the town itself—you won’t run out of tour groups to join, even if you’re traveling solo. I advice joining groups instead of renting a whole boat since it can save you a lot of money. Plus, it just makes the whole tour much more fun! I have personally tried a reputable tour operator in El Nido, and I highly recommend it for those wanting to explore the island safely. Should you wish to book your tour online, you may also do so via the Klook website. The main language spoken in El Nido is Filipino but a percentage of Palawenos still use and understand Cuyonon, the native vernacular in the province. People are also proficient in Hilagaynon, Bicolano and other Visayan language. 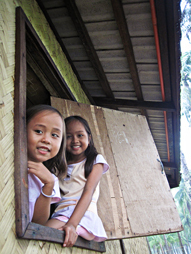 For English-speaking nationalities, communicating with the locals wouldn’t really be a problem since most Filipinos can speak English. In case you want to endear yourselves to the locals, here are a few Cuyonon words you may use. The main mode of transportation in El Nido is the tricycle. It is a bit wider than the usual ones and can seat four regular-size individuals inside, and one—sometimes two—at the back of the bike itself. For non-special rides, meaning you’re not renting the whole tricycle, the minimum fare is at PHP10.00 per person. Confirm the fare before boarding. Whole day bicycle rentals in town starts at PHP 400.00, while motorbike rentals is at PHP 500.00 There are no jeeps, taxis, Uber or Grab in El Nido. Most assume that staying in El Nido is expensive, but truth be told, it has a barrage of accommodations for all types of travelers. It has a lot of budget accommodations that wouldn’t even reach the thousand-peso mark—and these are even set right by the beach! Midrange accommodations are also available around town, but if you have money to burn, you can stay on luxurious island resorts! The main area for lodging is along El Nido town facing Bacuit Bay. Off its right side, accessed by a small road is the Caalan Beach, the quieter side of town where you can also stay. And on the left side is Corong Corong, where a lot of lodgings are also located. Even the far-away Nacpan Beach now has lodgings for travelers. El Nido is known for bird’s nest soup—that’s actually where the town got its name—but it is quite expensive. A genuine one would set you back hundreds and even thousands of pesos. But fear not, the area is replete with all sorts of restaurants and eateries that can suit everyone’s taste and budget. The more expensive ones can mostly be found along the shore of Bacuit Bay, and the cheaper ones along the side streets around town. Here’s a where to eat list in El Nido. El Nido is blessed with numerous islands and islets blessed with emerald lagoons and fine white sandy beaches hemmed by towering limestone karsts. The sights are absolutely gorgeous—blessed both above land and below water—it is truly one of the most beautiful destinations in Palawan. 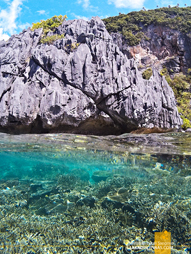 Without going around the islands, El Nido’s mainland already boasts of beautiful beaches, caves, and waterfalls. For the latter, ask the guides first if there’s actually water cascading down as it gets pretty dry during the summer months. For adventure-seekers, the jump-off point for Mount Taraw is just a few minutes away by foot from downtown El Nido. Tours in El Nido are neatly divided into five groups, the first four—Tour A, B, C, and D—are island hopping tours, while Tour E, is a land tour that goes to the northern twin beach of Nacpan. If you have limited time, you can even combine these tours together. These are very organized and quite easy to book at almost the same rates in town. Note that unlike tours in Coron, you need not pay entrance fees to the islands as these are already covered by the PHP 200.00 environmental fee, good for ten days, that they require for tourists visiting El Nido. Traveling to El Nido for a holiday need not be expensive. Yes, there are luxury resorts around the island, which could really put a dent on your bank account, but if you prefer to visit El Nido backpacker-style, you may do so at a fraction of the cost. The first thing to look for is cheap accommodations. Lodging in El Nido is quite affordable, you may be surprised to find inns right along the beach without breaking the thousand peso mark. For tours, I would suggest you book a joiners tour instead of doing private ones—renting a boat for only two persons would be really expensive. As for the food, there are a lot of eateries in El Nido, although not right on the beach, which are around the hundred-peso mark. 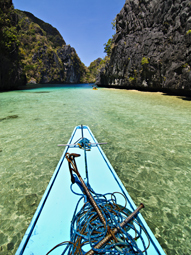 The question then is how many days should you spend in El Nido. If you want to do all the tours, six days and five nights would be the minimum stay in El Nido. Most travelers, however, only do the popular Tour A and Tour C, which cuts the stay to four days and three nights. All in all, if you do all the tours, including the land tour to Nacpan Beach, the van transfer from Puerto Princesa, the food and lodging, it would cost you about PHP 11,000.00++ for six days. But if you only do Tour A and C, it would cut your budget to around PHP 8,000.00++ for four days. Hello! How much did you shell out for the Linapacan Tour?